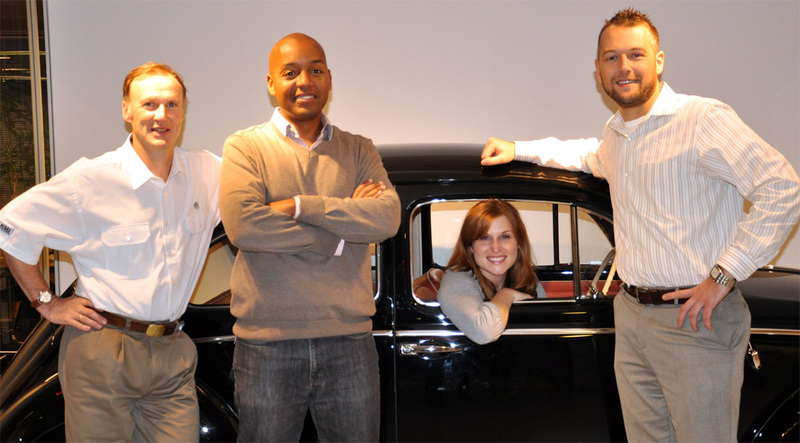 NEMPA isn’t often visited by carmakers unless they have a formal presentation to make, but when five people from VW’s national communications team stopped by one evening after Thanksgiving, it really was simply to meet, greet and socialize. More than two dozen NEMPA members, representing print, radio and TV media across New England and the nation, were able to talk, one on one, with Scott Vazin, VW’s VP of Brand Communications, Leigh Anne Sessions and Corey Proffitt, both Product Communications Specialists, West Coast Communications Manager Darryll Harrison and Product & Technology Manager Mark Gillies. NEMPA and VW both thank Automotion for hosting the evening. The company not only threw open its headquarters as a unique meeting place, but also laid out a fine spread of pizza, antipasti, drinks and deserts. 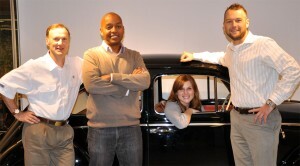 From left: Mark Gillies, Darryll Harrison, Leigh Anne Sessions and Corey Proffitt with a vintage VW item.